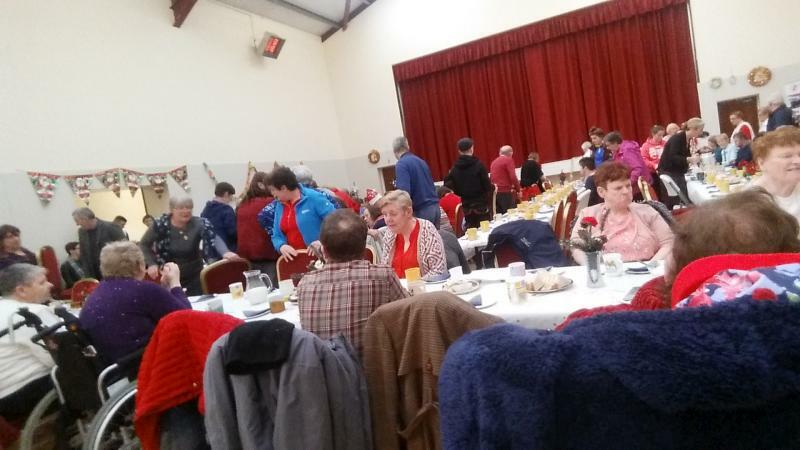 The Christmas season got off to a great start in Cullen on Sat. 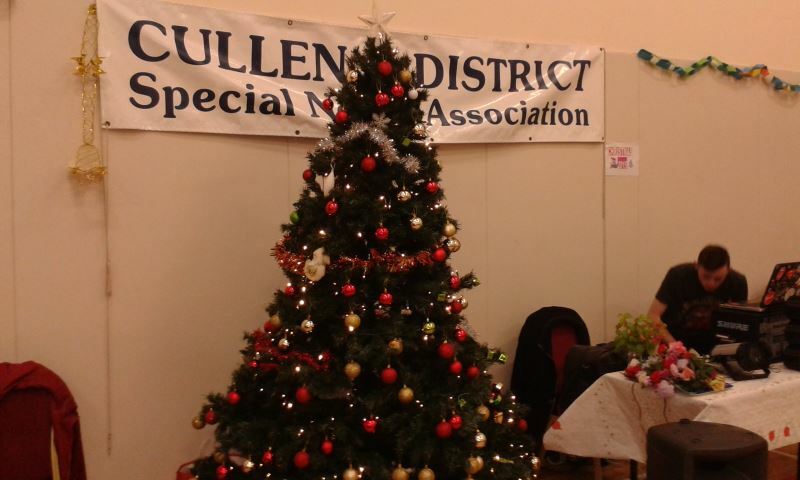 Dec. 2nd, when the Cullen and District special Needs Association hosted the 37th annual Christmas Mass in the seasonally decorated Cullen Community Centre, which was much admired and appreciated by all guests. The sun shone brightly as all assembled for Mass celebrated by Cullen native Fr,Anthony O’Keeffe, with the local choir and organist Susan O’Connor, adding to the celebration and making it such a special and meaningful occasion. Dr.Casey welcomed all the guests and was delighted to see such a great crowd. 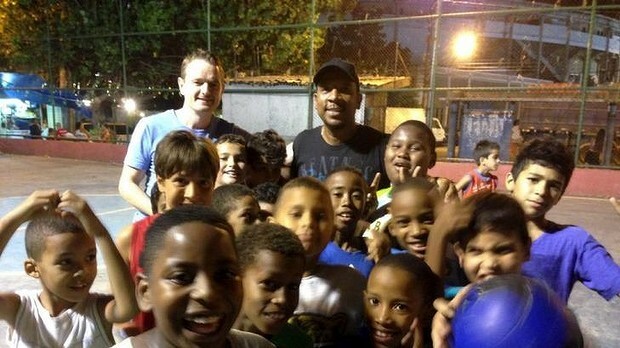 Afterwards there was plenty of food, music and craic to pass the afternoon, including a brilliant disco with D.J. Sean Sheehan. There was no scarcity of dancers among the guests who also contributed songs. 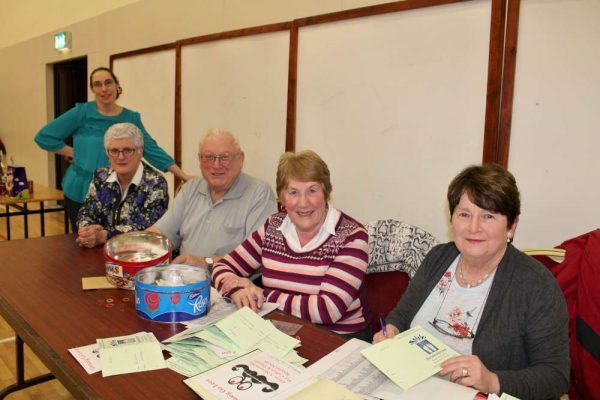 In the meantime the ladies from Kanturk Red Cross had a busy evening as many of the guests enjoyed some relaxing hand massage and nail painting. 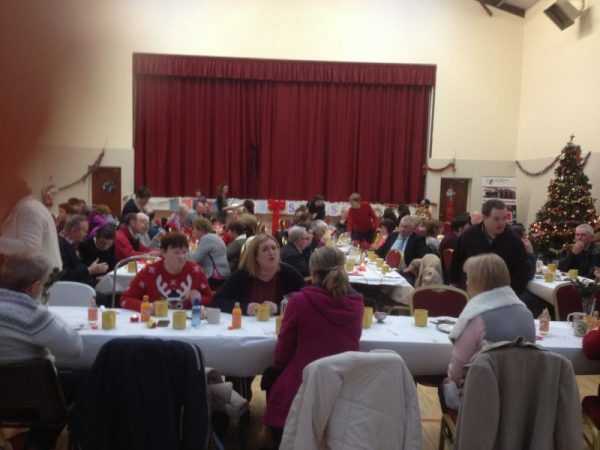 Our 36 th Annual Christmas Mass and Party took place on Saturday last,Dec.3rd in Cullen Community Centre.. 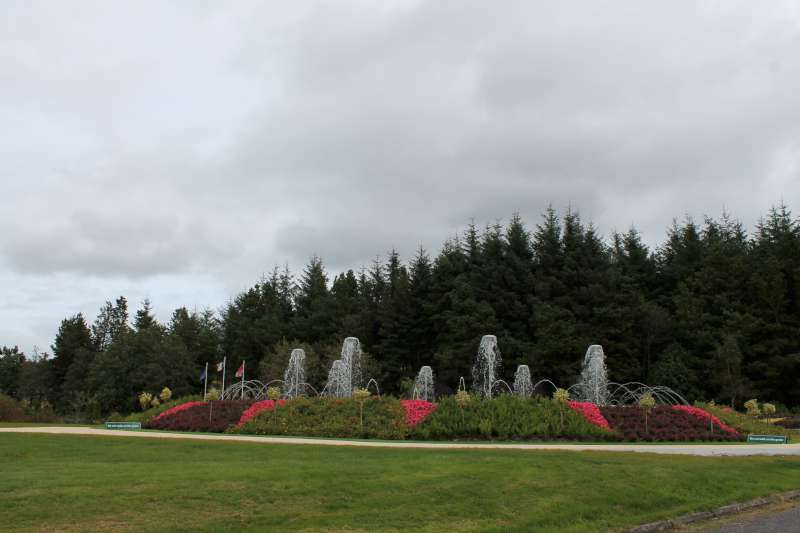 Weather conditions were perfect and a large number of our special friends attended with their families, friends or carers attended, from afar as Mallow and Kanturk to Newmarket, Millstreet and Gneeveguilla. Many thanks to all who came and supported the afternoon to make it such a success. 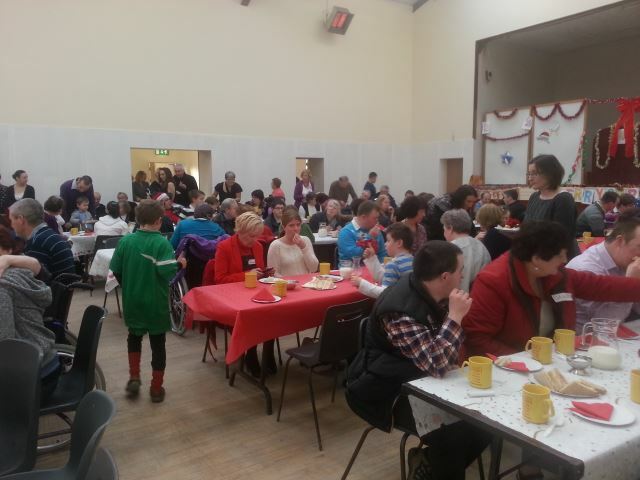 Our 35th Annual Christmas Mass and Party took place on Saturday Dec.5th in Cullen Community Centre. In spite of the wind and rain we were thrilled with the turn out from afar as Mallow and Kanturk to Newmarket, Millstreet and Gneeveguila. A large number of our special friends with their families, friends or carers attended. Weigh-In’ on Monday March 23rd 2015. 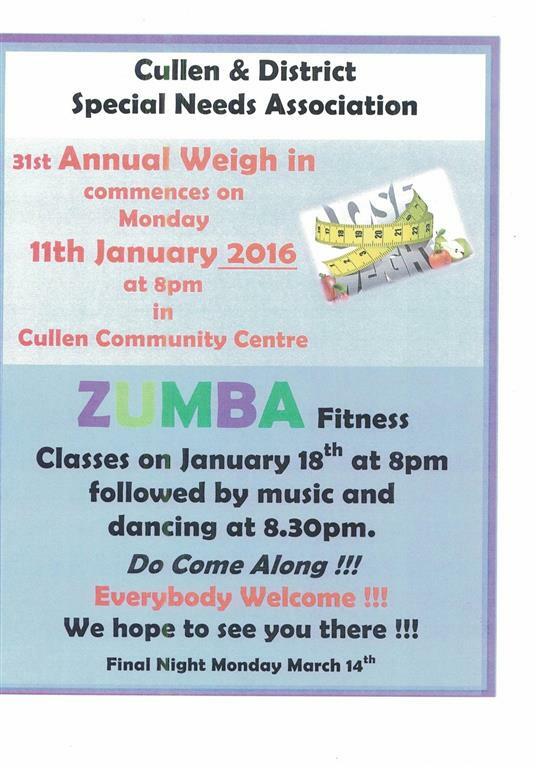 Just to inform you our Zumba classes finish on March 9th 2015. There will also be no weigh in on the 16th March 2015. 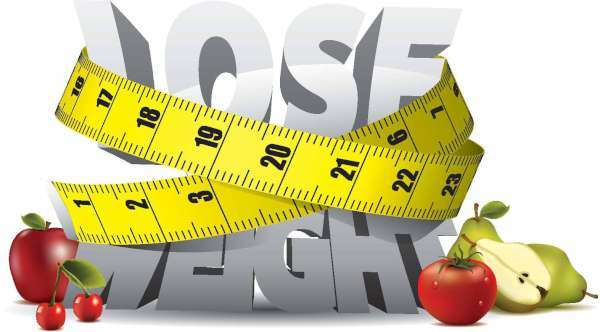 The Weigh-in will conclude on March 23rd 2015. 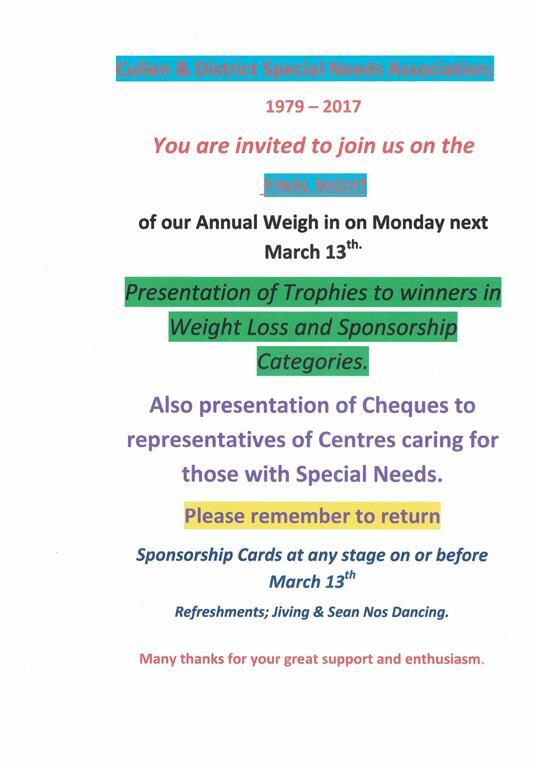 There will be a presentation of trophies to the winners of weight loss and sponsorship collected. 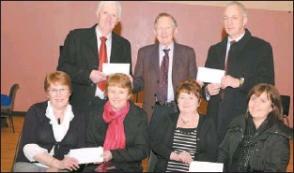 There will also be a presentation of cheques to the representatives of centers caring for those with special needs. Sponsorship cards can also be returned at any stage. 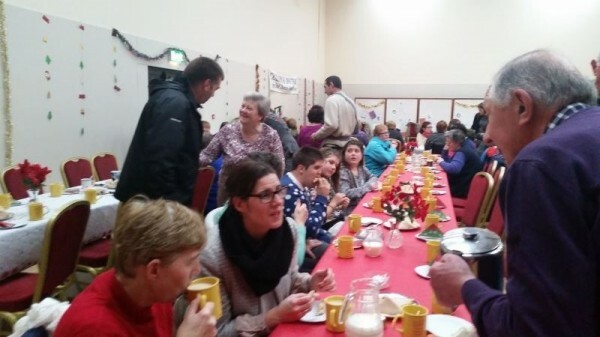 The Christmas season got off to a fantastic start in the newly renovated and attractively decorated Cullen Community Centre on Sat. Dec 6th when the 34th Annual Special Needs Association Christmas Mass and Party proved to be another memorable occasion. 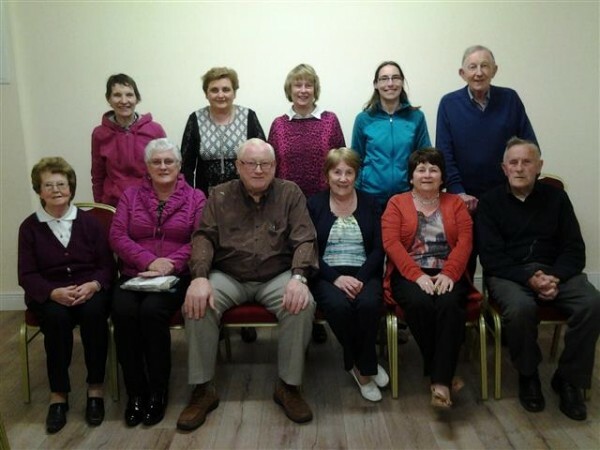 Mass was celebrated by Canon Jack Fitzgerald, accompanied by Susan O’Connor, and the local choir adding to the occasion. 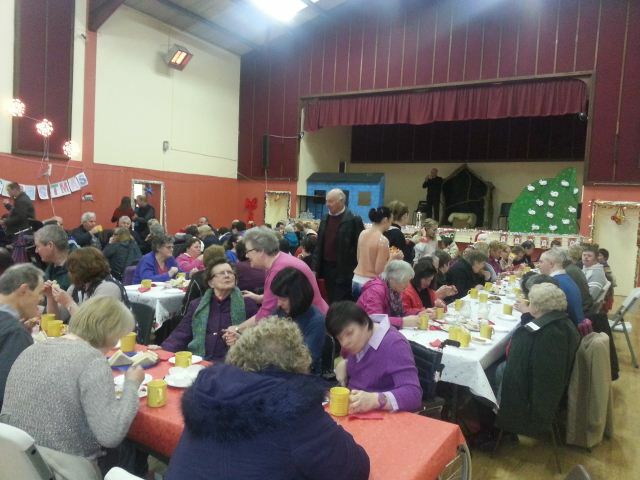 Afterwards there was plenty of food, music and craic to pass the afternoon, including a brilliant disco with D.J. Andrew Lynch. 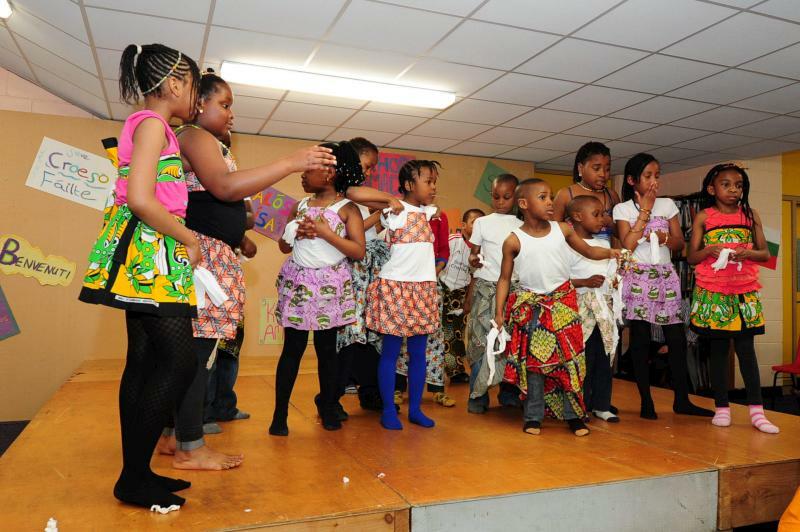 There was no scarcity of dancers among the guests who also contributed songs. The highlight for many was when Dr. Casey finished off the evening by presenting each one of our special friends with a Christmas gift. It is always a wonderful day for families and carers. Despite the absence of a number of regulars, some of whom had gone to their eternal reward and others who were indisposed through illness, a large number attended. Many renewed old acquaintances, as this evening attracts a regular clientele from outside the area. Once again the committee excelled themselves in staging this event, and they would like to thank everybody who ensured that the evening was so successful. A special thanks to all sponsors, helpers and the media who promote our events. We are indebted to the many people who have given so generously of their time, their talents and their resources over the years . 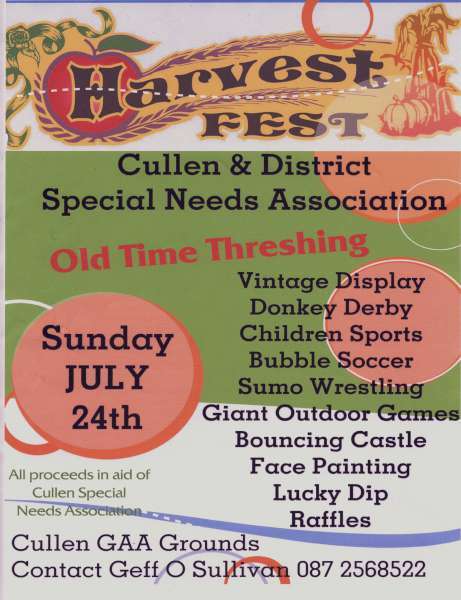 Cullen and District Special Needs Association wish all their Special Friends, their Supporters and Sponsors all the Joys and Blessings of Christmas with the best of Health and Happiness in the New Year. 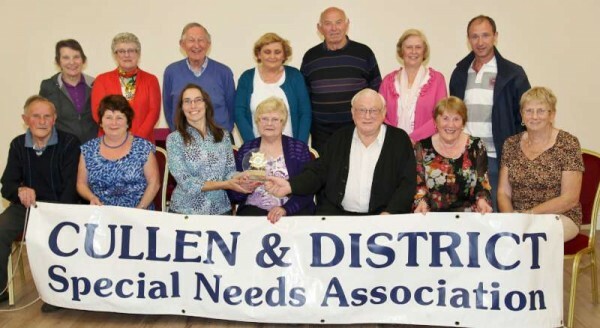 We thank Sheila Fitzgerald for the excellent photograph and the following caption: “Cullen and District Special Needs Association honoured its two founder members on Monday night with a get together at Cullen Community Centre. The event was organised to mark the couple’s 50th Wedding Anniversary and their fellow members presented them with a commemorative plaque and a decorative anniversary cake. Kathleen and Geff O Sullivan established the Special Needs Association 35 years ago and in the initial years held fundraising Vintage Shows at their own home. 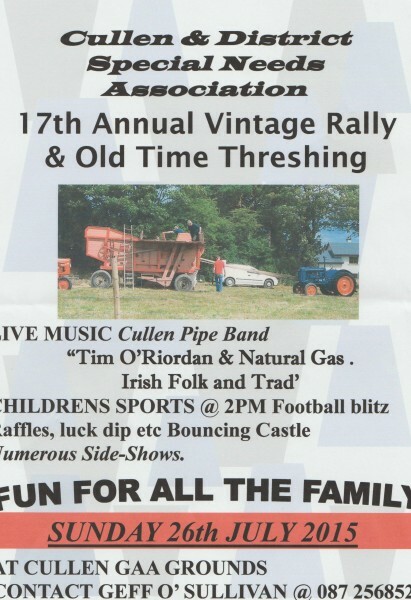 This event was relocated to the local Sports Grounds in later years and subsequently named the Annual Harvest Day and has always been a great success for the Club while the Weigh In during the Winter/Spring months is one of the major fundraisers. 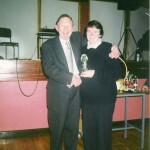 Secretary Moira O Keeffe told the Corkman that Kathleen and Geff were “outstanding” and worked extremely hard at every event throughout the 35 years. 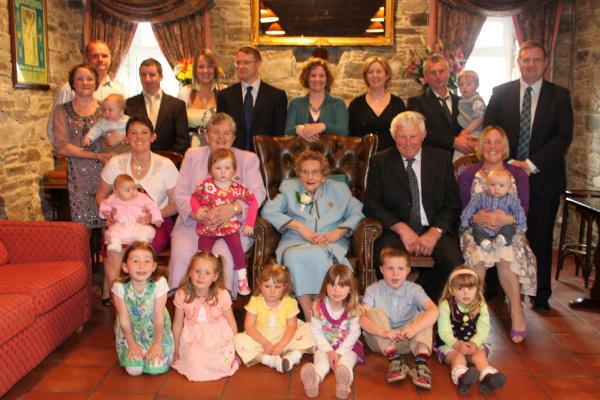 “We only had to ring and ask for anything and it was done” Moira said, and this was endorsed by all those present. 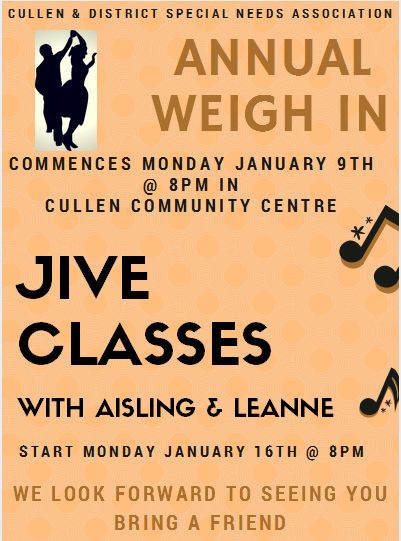 It’s that time of year again Christmas has passed and we invite you all to join us for our 29th Annual Weigh-in, beginning on tomorrow Monday Jan. 20th at 8.00 p.m, in the newly renovated Cullen Community Centre. Dr. Pat Casey will again oversee the Weigh in. There will be Aerobics conducted by Máire Heffernan and Hannah O’Connor followed by music and dance each night… (aerobics begin Jan 27th). We are extremely grateful to the many people who give so generously of their time, their talents, their services and their resources over the years to assist in our fund – raising efforts; all who sponsor and help to make the vintage afternoon such a great success, all who support our Weigh – in, and the media who promote our events. Monday. 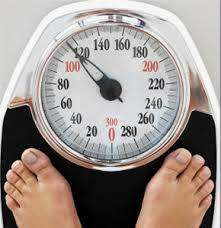 January 20th 2014 at 8 p.m.
Aerobics begin on January 27th at 8p.m. 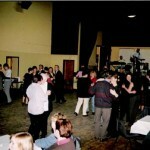 followed by music and dancing at 8.30p.m. 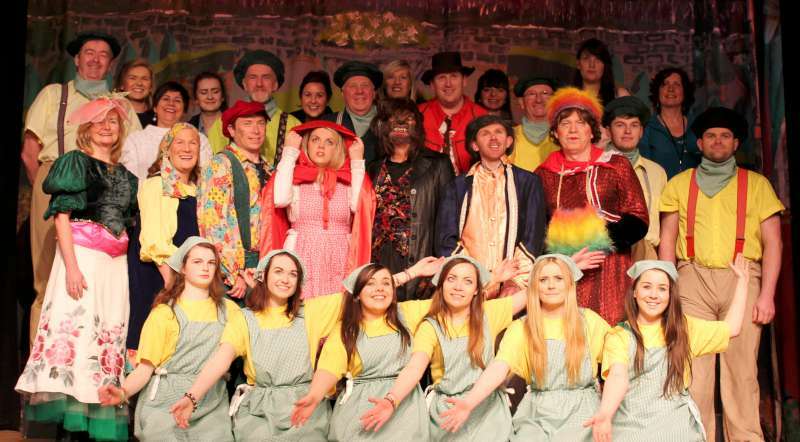 The Christmas season got off to a great start in Cullen on Sat. Dec. 7th when the Cullen and District special Needs Association hosted the 33rd annual Christmas Mass in the newly renovated Cullen Community Centre, which was much admired and appreciated by all guests. The sun shone brightly as all assembled for Mass celebrated by Canon Jack Fitzgerald, P.P. with the local choir and organist Susan O’Connor, adding to the celebration and making it such a special and meaningful occasion. Chairperson Breda O’Riordan welcomed all and was delighted to see such a great crowd. The grand finale of our 28th Annual Weigh in was on Monday Mar. 25th, when a large number of participants eagerly awaited the announcement of the winners in the different categories. 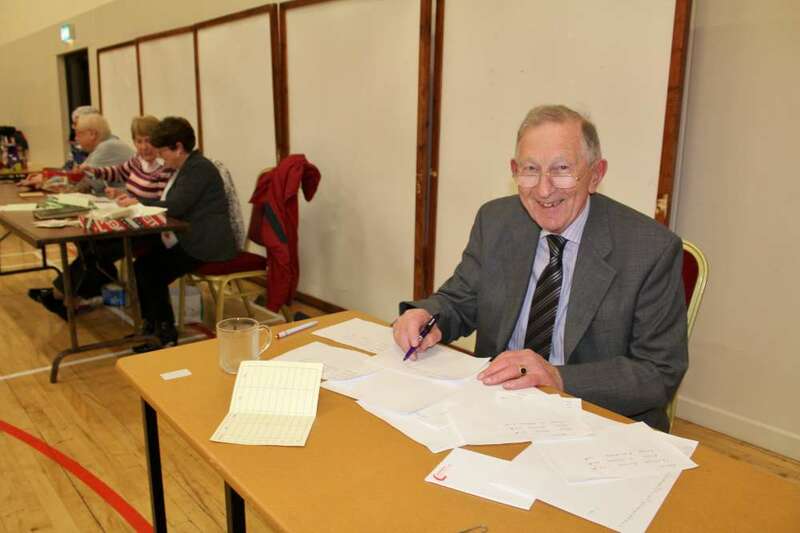 Dr. Pat Casey was kept busy calculating the weight loss of the different participants, while the officers collected sponsorship cards and money. There was a great party atmosphere, as refreshments were served and wonderful music played by our faithful group of musicians, who are a joy to dance to or just to listen to their fine music. The grand finale of our 28th Annual Weigh is on Monday Mar. 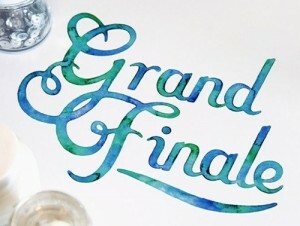 25th, when a large number of participants will eagerly await the announcement of the winners in the different categories. 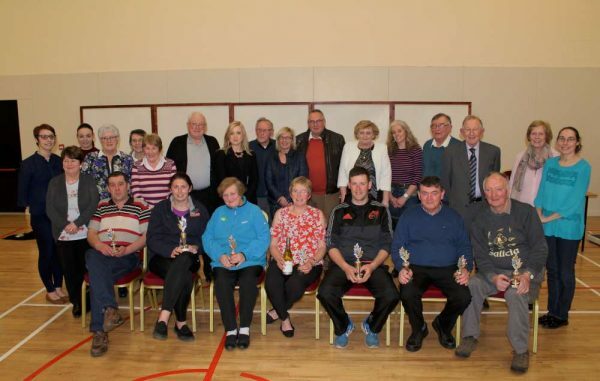 We appeal to all who took sponsorship cards to return them on or before March 25th when trophies, again generously sponsored by Robert Guerin, Ballydaly, will be presented to winners: – 1st , 2nd , 3rd to both ladies and gents for weight loss and 1st , 2nd , 3rd for Sponsorship collected. CULLEN and DISTRICT SPECIAL NEEDS ASSOCIATION 32nd Annual Christmas Mass and Party- Saturday Dec. 8th. 32nd Annual Christmas Mass and Party- Saturday Dec. 8th. 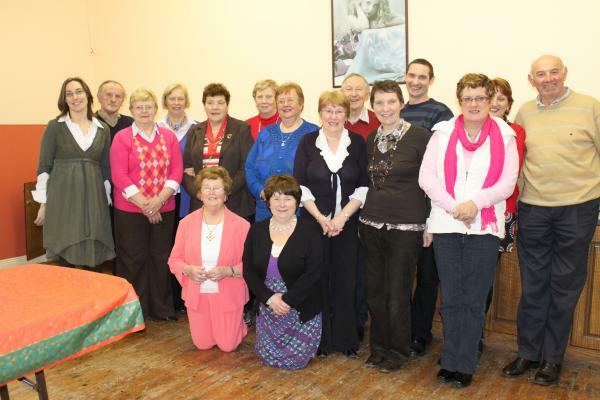 The 32nd anniversary of our first Christmas Mass and party was celebrated in Cullen Community Centre on Sat. Dec.8th and it certainly lived up to the success of the previous parties, some saying it was one of the best. Invitations were sent to approx. 100 special guests and their families. 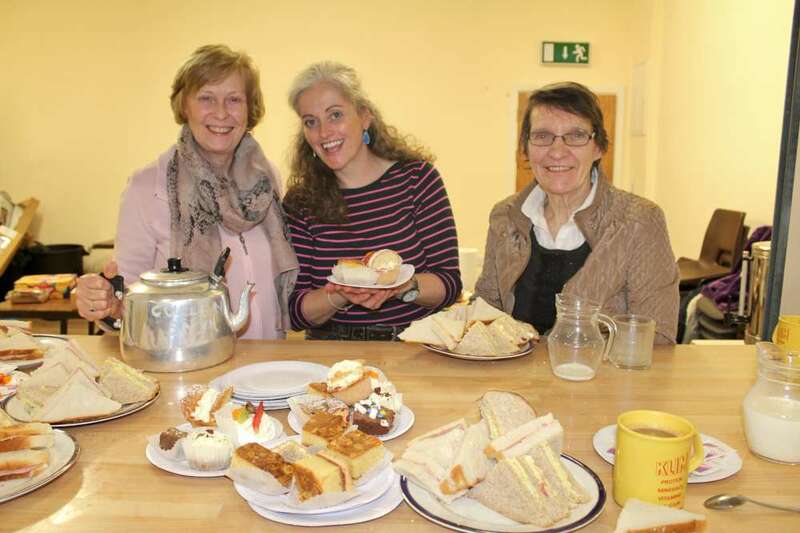 Despite the absence of a number of regulars, some of whom had gone to their eternal reward and others who were indisposed through illness, over 70 plus families and carers attended. Chairperson Breda O’Riordan welcomed all guests, families, carers and helpers and thanked all who contributed to the success of the party. 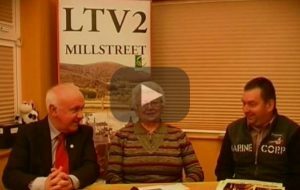 William Fitzgerald videoed our party and following on the recent successful launch of Cork Music Station, he presented a substantial cheque to Sec. Moira O’Keeffe. 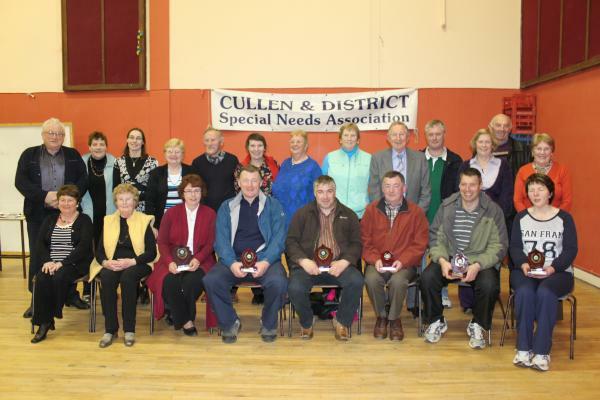 Prizewinners, Sponsors and Committee Members of the Cullen & District Special Needs Association on the final night of the Sponsored Weight Loss Programme 2011 when the annual prizes were awarded at Cullen Community Centre on Monday, 21st March 2011. 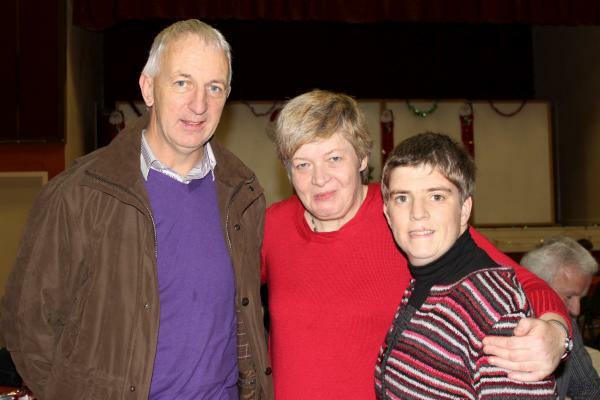 Conor Counihan was a very popular Guest of Honour at the Cullen & District Special Needs Association's Annual Christmas Party on 11th Dec. 2010. Some of the dedicated organisers of the annual Cullen & District Special Needs Association Christmas Party which was held in Cullen Community Centre on Sat. 11th Dec. 2010. Lots more pictures to follow later featuring Conor Counihan distributing the presents. It was all systems go in Cullen Community Centre on Mon. Feb.1st for the 25th annual sponsored weigh in. It was great to renew acquaintances from previous years and also to welcome many new faces. It was a big night for us as the weigh in had been postponed by two weeks due to the inclement weather in January.